I hadn’t really taken pics in a while and certainly not since I started to update my research and protocol 3 months back; dring which time I have found a lot of new info. Anyway, two original pics from Jan’04 and two pics from today; one with and one without the flash. I think I am seeing new growth at the hairline, but it is sloooooowwwww going; fortunately we are not talking 70 years (cheap shot). Today… (with and without the flash). WOW ! I am trying to add new products to my regimen. 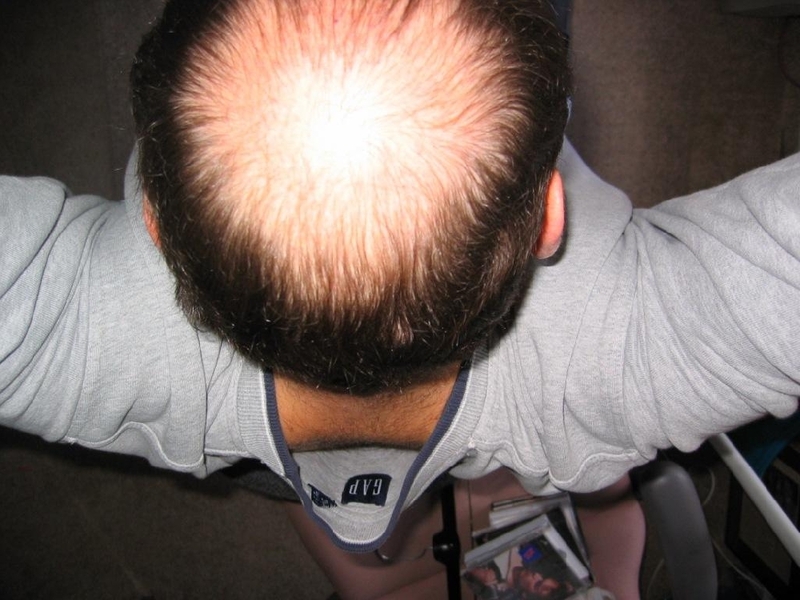 What do you think has helped you the most regrowing the hair? That’s really amazing you regrew that much hair without surgery. Great deceptive lighting and combing techniques. » Great deceptive lighting and combing techniques. Will you forever be known as “son of hairguy”? Either meet me and compare your results and mine in the company of an independent witness or accept, what most people here know, that you are a fraud and a big mouth. So do you accept my challenge; I will even let you name the US city? You have been called out. Just walk away like a coward. Come on let’s be serious here. There is no denying there is regrowth here. Whatever it is you’re doing keep it up. How many people walk around all day setting off a flash right over their head? If it looks good in an office or work situation then great. I think it looks a hell of a lot better. Congrats. Hey gc, it looks like you actually have more growth in the front than the crown, am I correct? Well, your credibility has just been shot all to hell for me. His regrowth pics are much more honest than are yours…MUCH MUCH MUCH more honest. They are clear, not from some dishonest angle, and clearly show the BEFORE AND AFTER. I dont want to burst anyone’s bubble completely, and if you dont want to use shampoo and just clean your hair with witch hazel and water, thats one thing. But to deny that finasteride/dutasteride/topical spironolactone/topical ketoconazole/topical minoxidil/topical pirocotone olamine/topical copper peptides dont help is like saying water isn’t wet. There are third party scientific studies of all of them demonstrating efficacy. 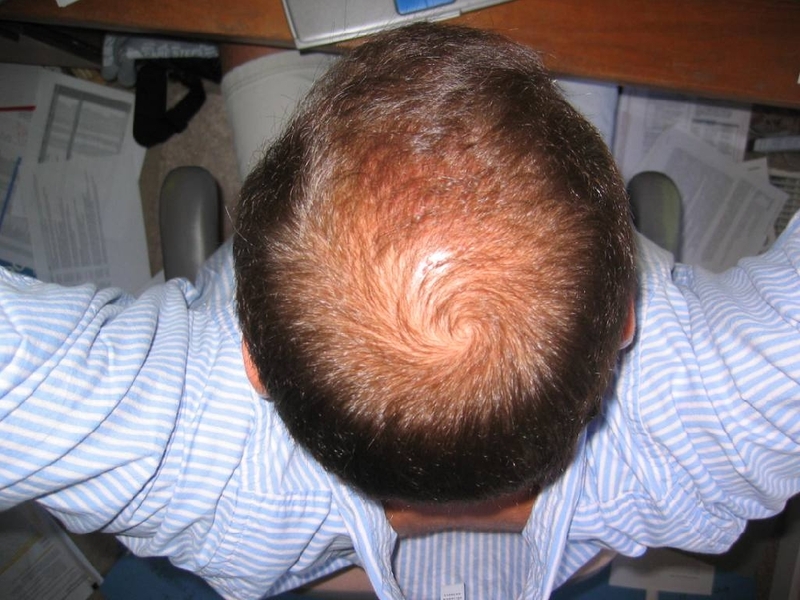 If GC was using a skin-remodeller (prox-N) along with some topical spiro in addition to the topical keto/dutas/minox, he’d probably have even more regrowth----and he has definite regrowth. I, like Hangin-in-there, will also be glad when the 15th has come and gone. 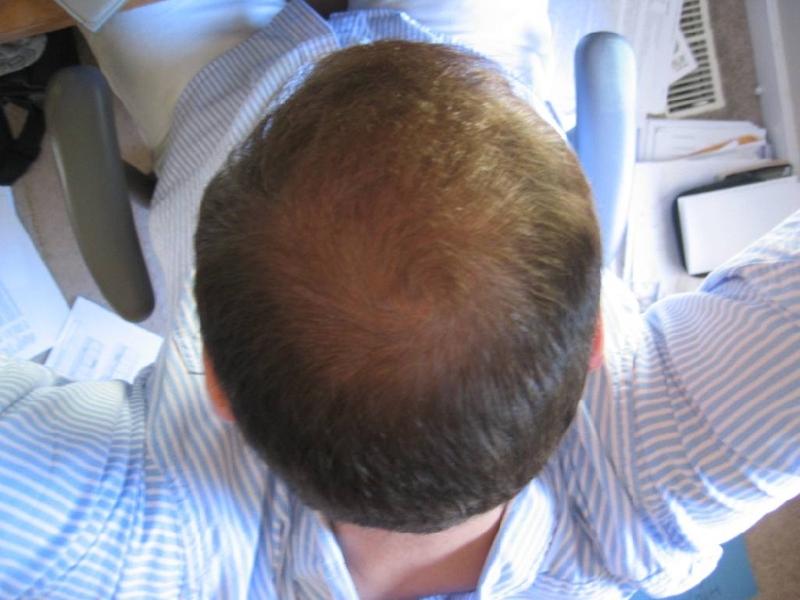 These forums used to be real hotbeds of new discoveries in hair genetics, but they are turning into places where folks just argue for the sake of arguing over no-brainer points. » the BEFORE AND AFTER. » olamine/topical copper peptides dont help is like saying water isn’t wet. » regrowth----and he has definite regrowth. » sake of arguing over no-brainer points. » crown, am I correct? Good observation IPOD; here is the full story. I had early hair transplants (age 19 in 1980) and again in the mid-late 90s; the first ones were horrible plugs in London, the later ones better in the US (I still have the scars). The before pics posted on this thread were taken in Jan’04; 6-7 years after my final transplant, and at the time I started focusing on herbal, drug and topical options. The frontal section, where I had transplants; I grew a lot of hair here and I don’t know whether this was activating transplanted hairs that never grew after surgery or whether it was from original dormant follicles. I am being brutally honest here (I have no reason to lie), and hope that the information is taken that way. I have been using topical spiro for a month or so as part of my new revitalised protocol; topical spiro should indeed help. » » Great deceptive lighting and combing techniques. To be accurate, most of my regrowth happened in the first 5 months; it started within 2 months. The key for me is that what I regrew has not been lost in that time and in fact I think I am seeing new growth now with my expanded protocol. » » crown, am I correct? » Good observation IPOD; here is the full story. » in the US (I still have the scars). » drug and topical options. » grew after surgery or whether it was from original dormant follicles. » the information is taken that way. Wow, definitely one of the better ones I have seen without surgery. How old are you? You in your 20s, 30s, 40s? I think people respond better if they are younger. I started the fight when I was 42.5. » 46. I started the fight when I was 42.5. Nice mate. 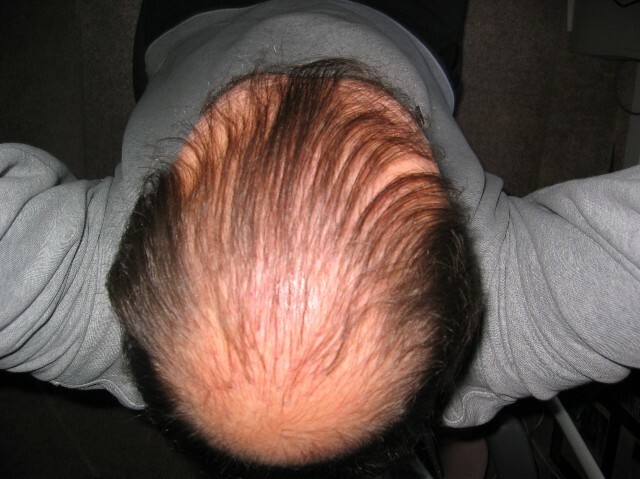 It will be good when Neosils product comes out, I reckon you’ll get most your hair back considering what you’ve achieved with your current regimen. You may even be able to stop using some of the other products. BTW, what is you full regimen and how much are you spending a month? » » » Wow, definitely one of the better ones I have seen without surgery. » » » are younger. » » 46. I started the fight when I was 42.5. » regimen. You may even be able to stop using some of the other products. » BTW, what is you full regimen and how much are you spending a month? when should neosils product come out? My protocol is off the charts in terms of the stuff I am taking; I don’t need to do this to maintain the hair I have grown back, which has remained stable for 3 years, but because I am trying to hit the problem from many new directions that my research has uncovered. I will providse an update as soon as I determine whether my new thinking is working; no later than end Sept. Sorry, but I want to give the new stuff a few months to determine effectiveness.